It was a very mixed bag coming out of Fonterra’s interim report. 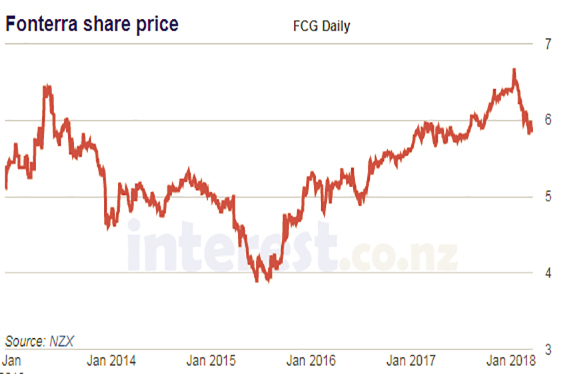 The headlines are the impact of the decision to go with Beingmate with Fonterra’s 18.8% shareholding being written down to $244 mln a drop of $405 mln and of course the cost of the Danone issue taking a lot of the gloss of the cash results. The Chair’s and CEO report focuses on the hard year many farmers have had, despite this dairy farmers will welcome the lift in the projected payout of $6.55 up from $6.40 plus an additional 25 to 30 cent dividend payout lifting total projections to $6.80 - $6.90 per kg MS. The baying for blood over the China fiasco may be silenced by Theo Spierings decision to resign. Now interest will be on who the replacement will be and no doubt the pay package, especially given that recent events indicate pay doesn’t necessarily equate to performance. A review of the period Theo has reigned over Fonterra will be seen as having mixed results with perhaps the outcome of future performance being the decisive component of whether he has been successful in setting up a period of prosperity for dairy farmers. The Australian foray with the help of some lucky events has certainly been a successful addition to the balance sheet. However, the missed opportunity into A2 until recently shows narrow thinking which has allowed Synlait to steal a significant march on the dairy giant. China’s returns will no doubt continue to grow but what could have they been with a different approach? Speaking of Synlait, with much of the media discussion focussing on Fonterra, Synlait’s record interim results could have been missed. It’s all good news for the David of the dairy world, debt has decreased by almost $100 mln while profits have increased by over +$30 mln to $40.7 mln. Synlait’s share price jumped from $8.18 at close of market on Tuesday to $9.40 before settling to a respectable $9.16. The drums are beating in the bush again regarding the mycoplasma bovis (MPB) and MPI could do well to get their communication section into gear. If what the rumours are saying are any where close to being correct then the horse has bolted and MPB has been here since early 2016, potentially infected calves have been sent throughout the country and less than half of these ‘transactions’ are able to be traced. Along side this farmers are waiting for their results from bulk testing and are having to delay livestock sales. This despite knowing MPI have been sitting on the results for some time. As if not enough was happening the latest GDT also took place and had another drop going down -1.2% to a weighted average price of US$3,632. However, the all-important whole milk powder price, as it did last GDT, bucked the trend and had a slight lift to US$3,226 helping protect the projected milk payout.